The ASBC General Assembly was held in the Grand Fourwings Hotel in Bangkok, Thailand where 36 delegations attended in the most important Asian meeting. 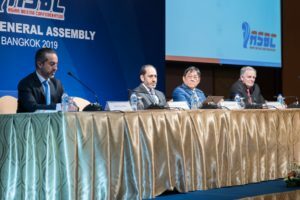 ASBC President and AIBA Vince-President Mr. Anas Alotaiba, AIBA Executive Director Mr. Tom Virgets, President of the Thailand Boxing Association Mr. Pichai Chunhavajira and ASBC Executive Director Mr. Ali Salameh led the ASBC General Assembly in Bangkok. The ASBC General Assembly was taking place before the start of the ASBC Asian Confederation Boxing Championships and the fruitful meeting delivered excellent unity of our continent in Bangkok. On behalf of the Sports & Tourism Minister of Thailand the member of the Culture and Olympic Heritage Commission of the International Olympic Committee Mrs. Khunying Patama Leeswadtrakul opened the ASBC General Assembly. She introduced Thailand’s efforts in all areas of sport and the hospitality of Land of smiles. Mr. Pichai Chunhavajira mentioned that the boxing community arrived to a key milestone and the unity of the sport is Thailand’s main message to the continent. ASBC President and AIBA Vice-President Mr. Anas Alotaiba is thankful for the hospitality of Thailand Boxing Association and to host the ASBC General Assembly and the ASBC Asian Confederation Boxing Championships. The Executive Director of the Asian Boxing Confederation Mr. Ali Salameh led the Roll Call in Bangkok. Following this official point it is recognized that 36 countries out of the 43 affiliated Asian National Federations attended in the ASBC General Assembly. The Hand Over from the previous management was the next part of the ASBC General Assembly. Mr. Ali Salameh informed the participants of the meeting that the previous email address, the access to the ASBC website and Instagram pages were received from the last management. The financial data as bank statements, assets and liabilities, the National Federations Database and the documents were not received yet. The approval of new amendments of the ASBC Constitution was the next section of the ASBC General Assembly. According to the newly approved rules the ASBC Executive Committee will consists 16 persons. The ASBC Competition Calendar was also approved by the participants which contains five continental events in 2019 to cover all age groups. Thailand, Kuwait, United Arab Emirates, Mongolia and Uzbekistan will be hosting ASBC Asian Confederation Boxing Championships in various age groups in 2019. The approval of the ASBC Budget, the Appointment of the External Auditor and the Open Discussions were the next points of the ASBC General Assembly. Philippines, Pakistan, India, and Jordan were active during the friendly Open Discussions. AIBA Executive Director Mr. Tom Virgets shared the information with all members that AIBA opened boxing for professionals in 2016 and the rules are still effective. Mr. Virgets introduced the current situation between AIBA and the International Olympic Committee, furthermore its progress. Mr. Virgets mentioned the antidoping improvements, the financial background, and the Referees & Judging system with its 21 new recommendations. ASBC President Mr. Anas Alotaiba underlined that AIBA is the only official governing body of Olympic boxing and the ASBC General Assembly approved the statement. The Technical Meeting and the Official Draw of the ASBC Asian Confederation Boxing Championships is scheduled to take place on April 18 before the first competition day.